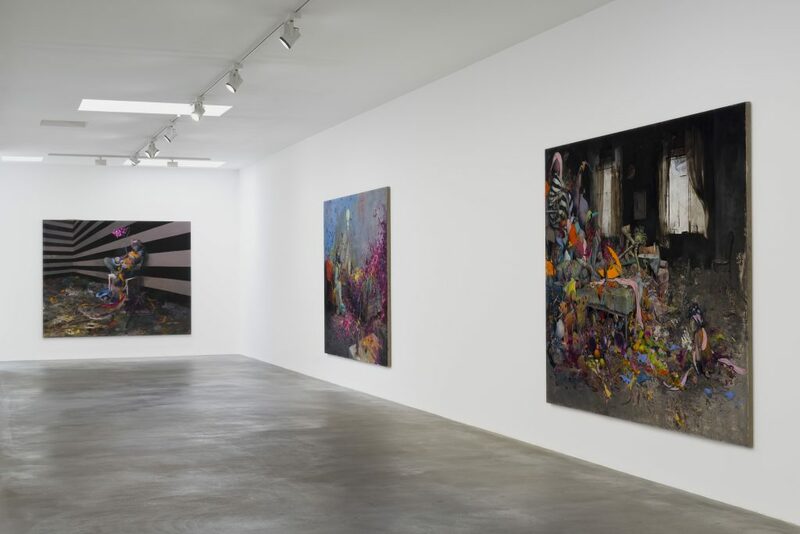 For Gallery Weekend Berlin 2017, painter Jonas Burgert returns to exhibit in his hometown, presenting his largest work to date: a 22m landscape painting that spans almost the entire length of the gallery. 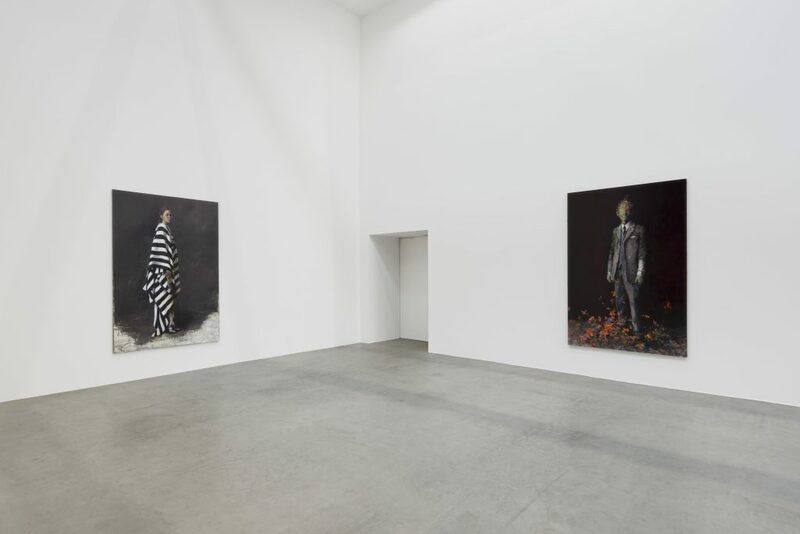 This vast psychological drama is faced by full-length portraits of figures on the opposing wall, who stare into the scene, posing the question whether they are passive observers or instigators of the chaos. 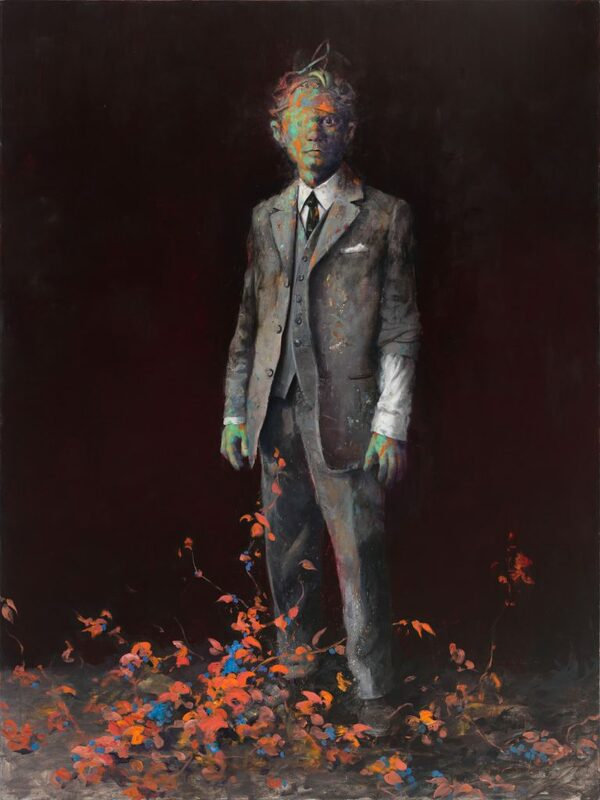 Jonas Burgert aims to personify human psychology through figurative painting. Astutely observing the minutiae of daily life, he bears witness to the entire range of human emotion. Loneliness, hatred, revenge, vanity and excess – a parade of human expressions feeds his imagination – giving form to the characters within his tableaux. Dominating the gallery at 22 metres in length, this latest work teems with fantastical figures and obscure objects of every kind. With this size of canvas, Burgert forces the viewer’s perspective so they become immersed in the detail of individual vignettes within the larger painting. Physical and mental effort is required to comprehend the picture in its entirety. This approach to scale offers the artist space in which to unfurl expansive pictorial dramas and explore non-linear storytelling. 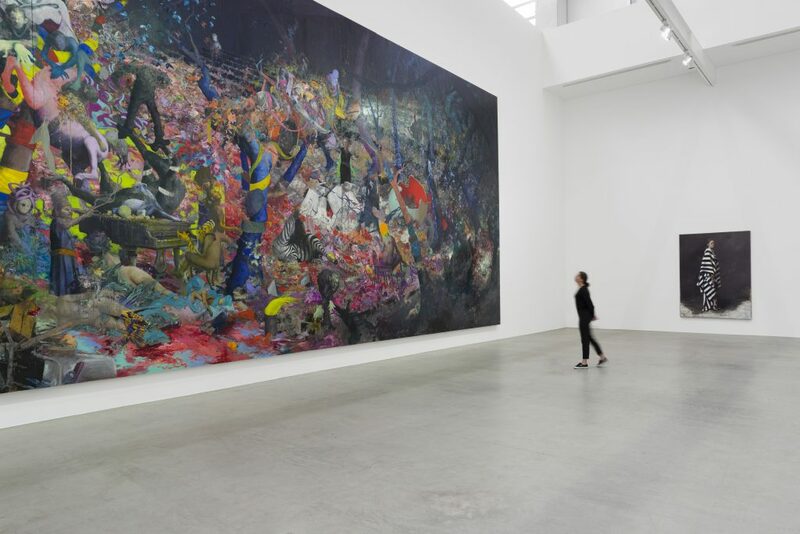 Having previously worked on canvases up to 8 metres in length, Burgert describes his need to paint on a large-scale as ‘not wanting to shrink the themes I’m interested in’ and sees his smaller paintings as extracted details of these expansive worlds. The studies of individual subjects on the opposite wall are characters removed from the heavily populated scene facing them. 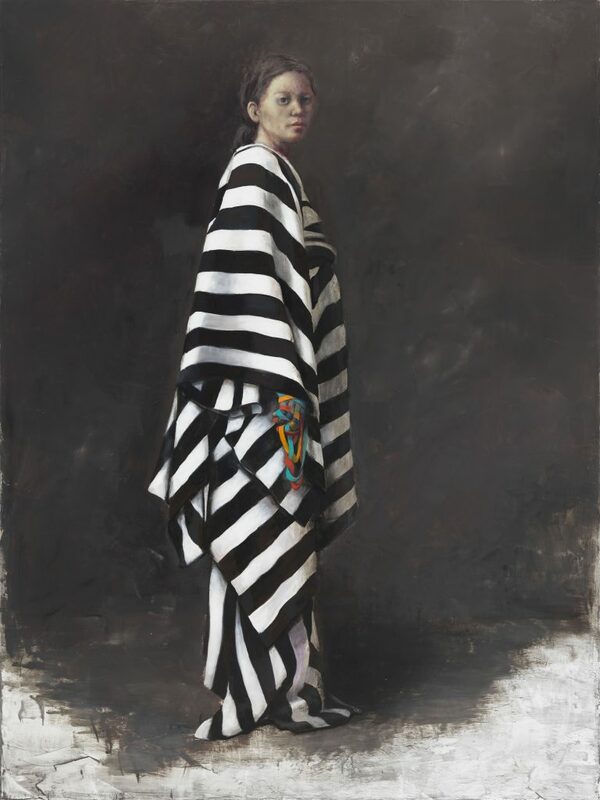 Works like Dachte Sie (2016), where a serene countenance stares towards the viewer, have a quiet stillness that contrasts with the frenetic panorama facing them. The space between each work echoes a sense of isolation in the characters. Each seemingly possesses a highly individual inner world, but is inseparably connected to the mass. This idea is further expressed through the disconnection between the figures in the large landscape, who never make eye contact with one another. These ideas of time, other dimensions and emotional undercurrents are also reflected in the ruptured layers of Burgert’s environments. Often breached by characters and architectural features, these tears in the pictorial plane reveal various levels existing simultaneously. 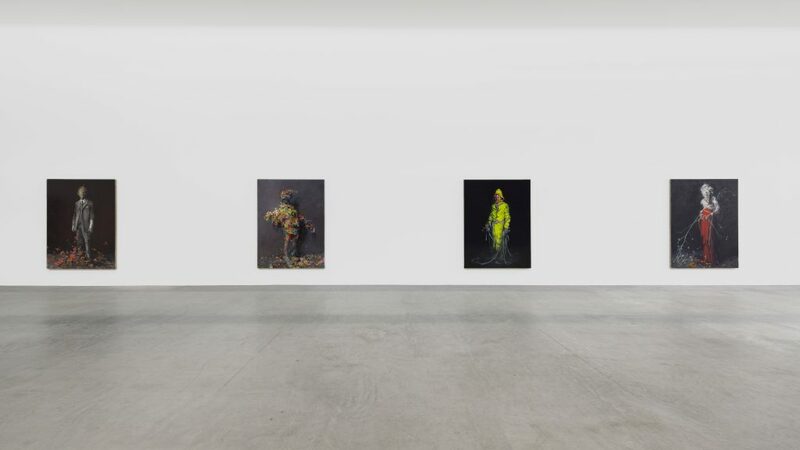 It is his dedication to the painterly exploration of colour, form and character, alongside more existential and sociological studies, that make Jonas Burgert such a unique presence amongst contemporary artists. 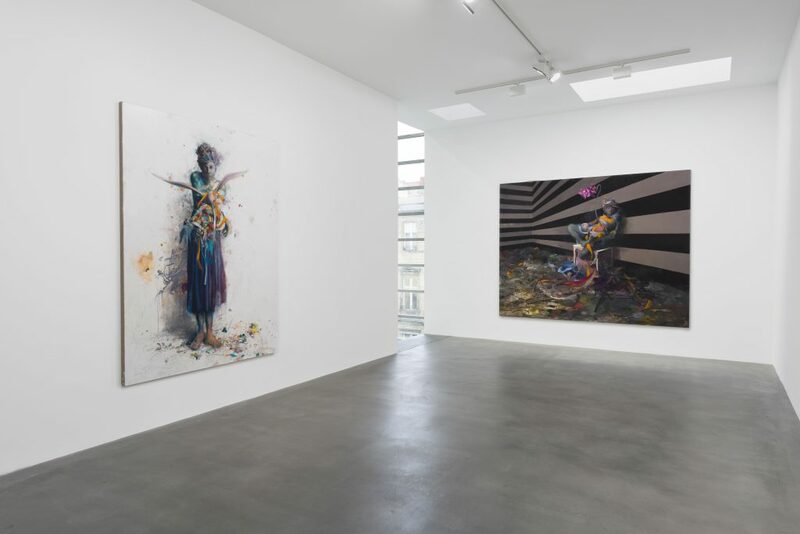 Jonas Burgert, ZEITLAICH, Installation view, 2017, Courtesy the artist and BlainSouthern, Photo Trevor Good. 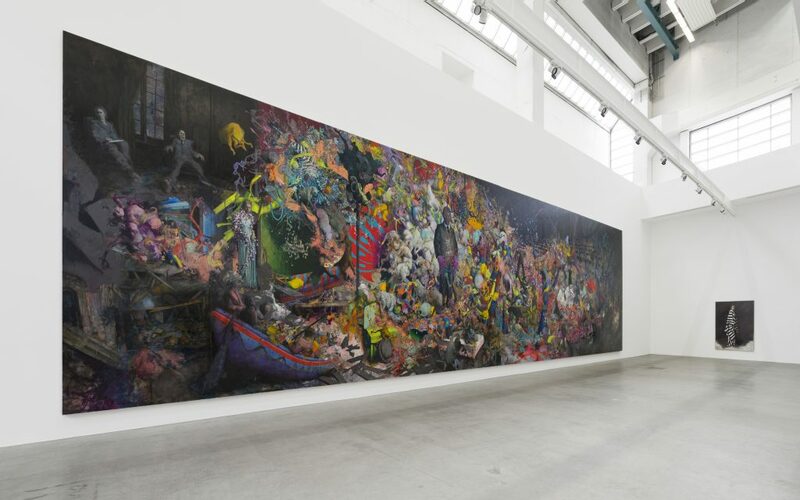 Jonas Burgert, Dachte Sie, 2016, Courtesy the artist and BlainSouthern, Photo Lepkowski Studios. 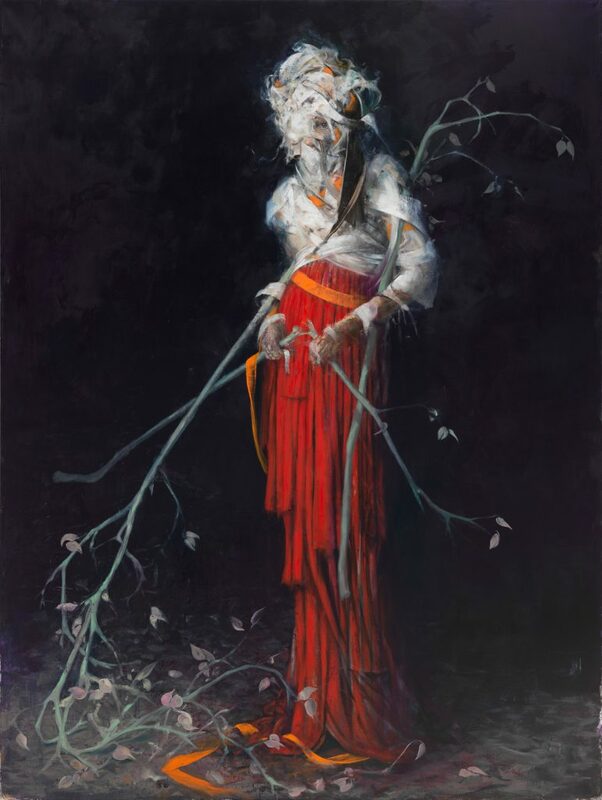 Jonas Burgert, ein Mut, 2017, Oil on canvas, Courtesy the artist and BlainSouthern, Photo Lepkowski Studios.